The Anxieties and Worries of Middle America II. What to do? Our economy has been stagnant since the end of the Great Recession five years ago. 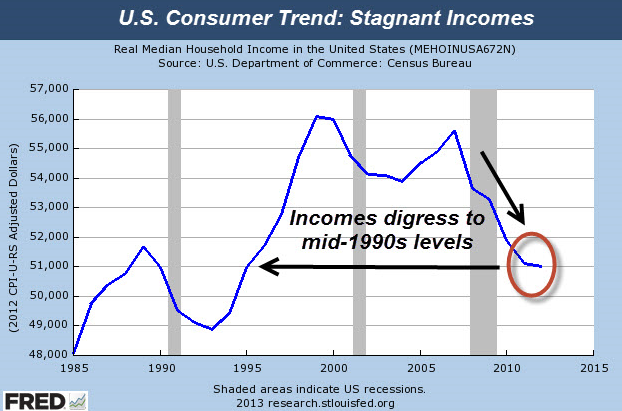 The median household income has not nearly returned to its pre-recession level. And now a new report has just appeared, “Room to Grow: conservative reforms for a limited government and a thriving middle class”, suggesting new approaches to address this major problem. How can we raise median household income and put millions of unemployed people back to work, at the same time? Deficit spending is no longer a viable option because our national debt is way too high already. Quantitative easing by the Federal Reserve has been tried, hasn’t helped very much, and is now being unwound. Consumer spending makes up 70% of GDP and so the most direct way to boost the economy is for people to spend more money. Can this be accomplished effectively and efficiently with government policy? The answer is yes! Broad based tax reform is the way to do it. Lower tax rates across the board for everyone, paid for by closing the loopholes and deductions which primarily benefit the wealthy. Two thirds of the American people do not itemize deductions on their tax returns. This means that lower tax rates for all of these middle income people will put more money in their pockets, most of which they will spend, thereby massively boosting the economy. Of course there will be pushback to this course of action from the millions of affluent Americans who benefit from all of the loopholes and deductions in our tax code. But our first priority by far is to help the many more millions of middle income Americans who are suffering from stagnant incomes at best or may still even be unemployed as a result of the recession. This entry was posted in broad-based tax reform, Jack Heidel, Middle America, middle class, Peter Wehner, pro-growth economic policy, pro-growth tax reform, Room to Grow, tax policy, tax reform and tagged economic growth, GDP, jack heidel, Middle class, room to grow, tax reform by jackheidel. Bookmark the permalink.